Client Notes - Use this area to record any general information about the client. These notes are for internal purposes only and will be displayed for each property under the Client sub tab of the Main tab. 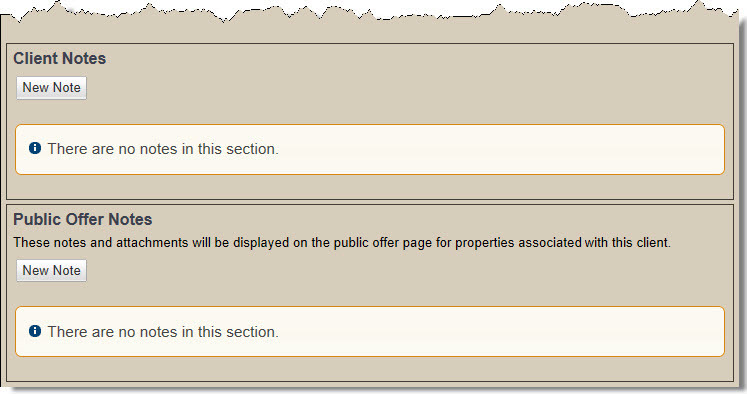 Public Offer Notes - Use this section to add any bank specific instructions and forms regarding how to make a public offer. To insert a note in either of these screens, Click the New Note button, then insert and format notes as desired. Click Add Attachments to attach any pertinent documents. When finished, click the Add button.